In May 1901, the Melbourne Age in describing the men of the new Federal Parliament referred to Senator O’Keefe of Tasmania as ‘a moderate Labor representative, a moderate protectionist and a moderate believer in many other things’.David John O’Keefe was born, probably on 21 August 1864, at Longford, Tasmania, to David John O’Keefe, farmer, and Mary Ann, née McCullagh. After leaving Carrick State School at fourteen, O’Keefe was successively driver of a horse-team with a road gang, labourer, farmhand, and, for four years from the age of seventeen, miner and quartz-battery operator at Beaconsfield. In his twenties, he owned a Beaconsfield swhtationery, tobacco, jewellery and newsagency business, which was lost in a fire, though later rebuilt. In the newspaper style of the times, ‘Dave’ O’Keefe had been Beaconsfield correspondent for Launceston’s Daily Telegraph, and after selling his business, he moved in 1891 to the new mining town of Zeehan as the Daily Telegraph’s special correspondent. A year later, he joined the Zeehan and Dundas Herald and was appointed editor in 1894. O’Keefe made a name for himself in Tasmanian and mainland newspapers with his many west coast mining articles, which were given depth by his study of mineralogy, and his knowledge gained as secretary to a number of prospecting syndicates. In 1899, he resigned from the Herald owing to ill-health and became a reporter for the Melbourne Argus on the Queensland copper fields of Chillagoe and Mount Garnet. Shortly after his return from Queensland, O’Keefe was elected as a Labor senator in the first Commonwealth Parliament, with the west coast mining vote being largely responsible for his success. In June 1903, he joined J. C. Watson, the federal Labor leader in the House of Representatives, in addressing the first Tasmanian labour conference in Hobart. Delegates were urged to make moderation the hallmark of their political platform and O’Keefe was appointed a member of the conference’s finance committee. O’Keefe was a conscientious Senator and talked on a wide range of matters, rather than just focusing on Tasmanian problems. His statement: ‘Federal rights have always been greater than State rights’, summed up the view of Labor politicians dubious about the creation of a federal system for Australia. As a Labor politician, he was in favour of preference to unionists (which he preferred to call ‘security to unionists’) and protection of union activists from employers. His experiences on Tasmania’s west coast made him ‘an ardent advocate of the principle of compulsory arbitration’, for he believed that factory workers would not receive ‘their fair share of the profits’ while Australia lacked a conciliation and arbitration Act. He linked support for a White Australia with protectionism, which he saw as vital to the maintenance of Australian jobs. ‘I want’, he said, ‘to see the day speedily arrive when the placard “Made in Australia” will be the most powerful passport to the pockets of the people’. A long-standing aim was the amendment of section 51 of the Constitution, to permit payment by the Commonwealth of pensions to ‘widows of any age’, something he pushed every year from 1911 to 1914. O’Keefe was a firm supporter of the Commonwealth Bank, writing to his former fellow Labor parliamentarian, King O’Malley, in 1937: ‘I do remember that the idea of the Bank being placed in our policy first came from you’. Like many Tasmanians of his generation, O’Keefe had supported Tasmania’s entry into the new Federation—he later spoke proudly of having done his best with his pen for the ‘yes’ vote—but said that he had been sadly disillusioned by the rapid decline in the finances of the smaller states. He soon reached the conclusion that the financial machinery in the Constitution was worn out, and that a new machinery was required to do common justice to the smaller states. As early as 1906, he asserted that Tasmania and Queensland could hardly carry on their normal governmental functions under the existing financial arrangements. He was determined to make his upper House colleagues see that the smaller states had suffered because of their geographical separation, and were well within their rights in asking the Commonwealth Parliament ‘to remedy the financial disturbances’ which had devastated their economies since Federation. Late in his life, he reflected that at the time of Federation he and ‘the other young enthusiasts’ had relied on state politicians to honour the spirit of the occasion as well as the constitutional text. 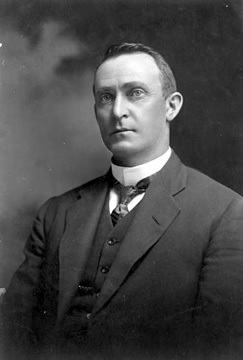 In local Tasmanian politics, O’Keefe performed important service for the Labor Party, especially after his 1906 defeat, when he was Australian Workers Union organiser for Tasmania. As the historian R. P. Davis has noted, the influence of the Union was ‘a vital factor in the development of Tasmanian Labor’ at this time, and O’Keefe was active in many aspects of labour politics. He was a Tasmanian delegate to the Labor interstate conferences of 1915, 1917, 1918, 1919 and 1924 and to the Federal Executive meeting of July 1916. He was a fervent supporter of Irish self-determination, serving as one of Tasmania’s four representatives at the national convention of the Australian Self-Determination for Ireland Leagues held in Melbourne in July 1921. O’Keefe was re-elected in 1910 and 1914. Despite his having spoken in favour of compulsory military service in pre-war years, O’Keefe fought for the anti-conscription side during the war, though he supported the two referendums in 1916 and 1917: ‘The great heart of the people may be, I think, trusted on this as on other questions’. O’Keefe also worked hard to avoid the split in his Party which was the consequence of the bitterness over this issue. While he did not see ‘eye to eye’ with his leader (W. M. Hughes) over conscription, nevertheless he gave Hughes his utmost support, referring to the Prime Minister’s sixteen years of ‘magnificent work’ for the Labor Party. He was a member of the federal parliamentary recruiting committee from its appointment in June 1917 until it lapsed in early 1918. The committee consisted of government and opposition members of both Houses, with representatives from each state, who were appointed to devise means for stimulating recruiting. In the aftermath of the war, O’Keefe called on the Parliament to do all that could be done for repatriated soldiers. He attacked the ‘rotten’ system of payments made to dependents of soldiers killed in action, and asserted that those guilty of profiteering ‘should almost be stood up against a wall and shot’. Defeated in the Senate in 1919, in 1922, O’Keefe was elected as the Member for Denison in the House of Representatives, where he spoke frequently in support of Australian, especially Tasmanian, industry. After his defeat in 1925, he travelled to Western Australia. There he managed the Perth branch of the real estate firm of Labor politician, Tom Burke. Returning to Tasmania in 1931, he unsuccessfully sought to re-enter the Senate; he then turned to managing Launceston’s Terminus Hotel for two years. O’Keefe resumed a parliamentary career by winning the seat of Wilmot in the 1934 state election that brought the Ogilvie Labor Government to power. He retained this seat until his death in 1943, serving as Speaker from 1934 until 1942. In this position, he earned the admiration of both political parties. Later, members of the Opposition expressed their appreciation for his scrupulousness in applying standing orders. O’Keefe married Sara Frances Wilson on 17 June 1897, and three years after she died, he married Mrs Agnes Hughes, on 14 October 1924. Both marriages were celebrated in Melbourne. There were six children of the first marriage, of whom three daughters, Constance, Kathleen and Patricia, and one son, David, survived him. There were no children of the second marriage. His community work included support of friendly societies and membership of the Zeehan Town Board. He was an office holder in the Strahan and Zeehan Racing Clubs (both of which he helped establish). His hobbies included amateur theatre and rifle shooting. The aging O’Keefe died at Brighton on 21 July 1943 during a trip to Melbourne. A man whose slight figure did not immediately catch the eye, it was said that he ‘always commanded attention when he addressed the House’. Billy Hughes eulogised him as ‘a friendly soul, a lover of his fellow man in office, and accessible to all who sought his advice’. O’Keefe’s body was taken to Hobart where he was accorded a state funeral before burial in Cornelian Bay Cemetery. He had been awarded the CMG two years earlier. Age (Melbourne), 31 May 1901, p. 5. Scott Bennett, ‘O’Keefe, David John’, ADB, vol. 11; Daily Post (Hobart), 6 April 1910, p. 3; Mercury (Hobart), 5 June 1903, p. 2, 6 June 1903, p. 2, 8 June 1903, p. 5. Daily Post (Hobart), 15 April 1910, p. 2; Henry Reynolds, ‘Regionalism in Nineteenth Century Tasmania’, THRAPP, vol. 17, July 1969, p. 24; CPD, 14 May 1914, p. 1000, 10 September 1913, p. 1039, 21 October 1904, pp. 5916, 5920, 5921, 13 November 1901, p. 7186, 10 September 1913, p. 1034, 30 November 1911, p. 3445; Letter, O’Keefe to King O’Malley, 8 June 1937, O’Malley Papers, MS 460/5604/6, NLA. Typescript, probably by O’Keefe, in the possession of Scott Bennett, Canberra; CPD, 10 October 1906, p. 6363, 20 December 1911, p. 4896. Richard Davis, Eighty Years’ Labor: The ALP in Tasmania, 1903–1983, Sassafras Books and University of Tasmania, Hobart, 1983, pp. 117–122; R. P. Davis, ‘Tasmania and the Irish Revolution, 1916–1922’, THRAPP, vol. 21, June 1974, p. 80; D. J. Murphy (ed. ), Labor in Politics: The State Labor Parties in Australia 1880–1920, UQP, St Lucia, Qld, 1975, p. 416; CPD, 31 August 1910, p. 2268, 22 September 1916, pp. 8915–8916, 23 May 1916, p. 8348, 14 March 1917, pp. 11403–11405, 12 July 1917, pp. 109–110, 24 January 1918, pp. 3432–3447; Ernest Scott, Australia During the War, A & R, Sydney, 1943, p. 364; Patrick Weller (ed. ), Caucus Minutes 1901–1949: Minutes of the Meetings of the Federal Parliamentary Labor Party, MUP, Carlton, Vic., 1975, vol. 1, p. 487; Argus (Melbourne), 22 June 1917, p. 8; CPD, 11 July 1917, p. 8, 8 May 1918, p. 4447, 24 October 1919, p. 13979, 27 June 1919, p. 10201. Examiner (Launceston), 22 July 1943, p. 4; Mercury (Hobart), 22 July 1943, p. 4. Argus (Melbourne), 22 July 1943, p. 4; Typescript, probably by O’Keefe; Mercury (Hobart), 22 July 1943, p. 4; CPD, 23 September 1943, p. 23. This biography was first published in The Biographical Dictionary of the Australian Senate, vol. 1, 1901-1929, Melbourne University Press, Carlton South, Vic., 2000, pp. 239-242.